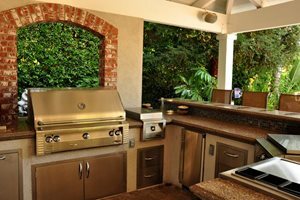 This outdoor kitchen has a plethora of appliances - a gas grill, a side burner, a wok burner and two wine chillers. Just like an indoor kitchen, the most important features are the appliances. 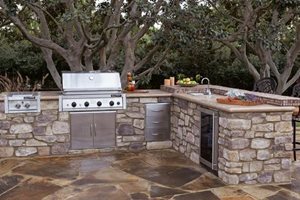 How you plan to use your outdoor kitchen will dictate what appliances you should get. 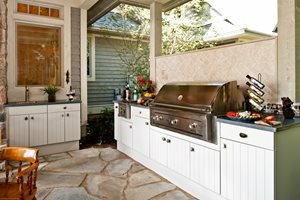 At the bare minimum, every outdoor kitchen needs a stainless steel built-in grill. If you want to go all out, you can have a large grill that cooks with charcoal, wood or gas, a pizza oven, a side burner, a refrigerator and a beverage station. Your appliance options don't stop there. There are outdoor teppanyaki grills, ice makers, wok burners, depp fryers and more. 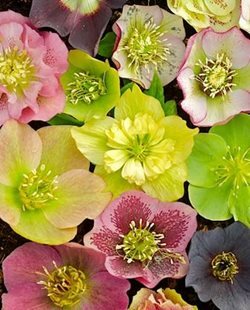 Don't be overwhelmed by all the options out there. 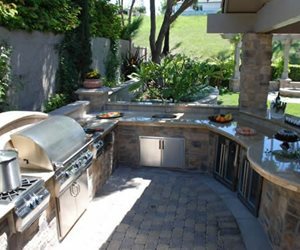 Start by thinking of what you plan to cook in your outdoor kitchen. 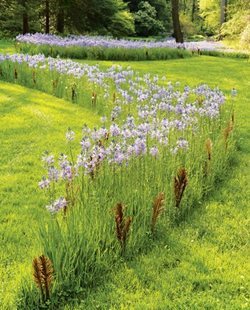 If you host typical barbecues with burgers, dogs and maybe some chicken and steak, a simple grill will suffice. But if you want to cook entire meals outdoors then consider adding a side burner and refrigeration. 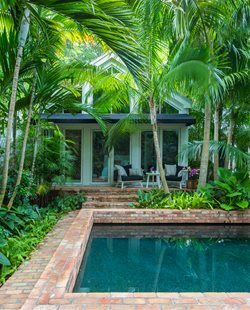 Knowing your budget will also help you narrow your options when it comes to outdoor cooking appliances. Some high-end companies offer products that cost as much, if not more than indoor appliances. 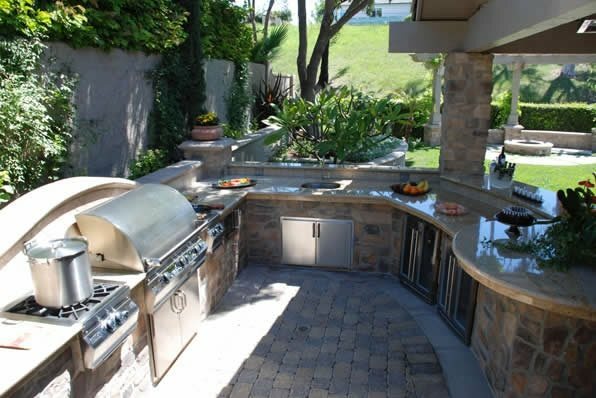 The most important appliance in an outdoor kitchen is the grill. Spend some time comparing your options before making a decision. Drop-in grills come in many different sizes, so think about how much food you will want to cook at a time. If you need more help determining what grill to buy check out this article: Choosing the Right BBQ.